Facebook is still the most popular social network, but its growth has slowed in the U.S., according to a new report out this morning from the Pew Research Center. Meanwhile, more Americans are now using multiple social media sites, allowing platforms like Twitter, Instagram, Pinterest and LinkedIn to all achieve significant increases in user numbers over the past year, the report found. It’s been said for some time that Facebook has reached “critical mass” here in the U.S., and these new figures go further to support that claim – the social network remains the most popular, but its membership levels here have seen little change from where they were in 2013. One exception to this is with the “older” adults demographic. For the first time, more than half (56%) of internet users ages 65 and older use Facebook. Yes: grandma and grandpa are now on Facebook. That brings to mind a recent article where 19-year old Andrew Watts explained how teens today really view today’s social media sites. In it, he referred to Facebook as “an awkward family dinner party we can’t really leave,” adding that Facebook is “dead” to teens, outside of its group functionality. In general, teens find Facebook “weird and annoying,” he said. Having mom and dad and now the grandparents, too, on Facebook, probably doesn’t help with that. While Facebook may have lost its “coolness” factor, at least according to one report, its user base is still highly active. 71% of U.S. Internet users are on Facebook – the same as in August 2013 – and 70% engage with the site daily, up from 63% in 2013. 45% engage with Facebook several times per day. And for the portion of the U.S. online population that uses only one social media site (28% do, down from 36%), Facebook is it. 79% of this group uses Facebook as their only social network. While Facebook still dominates, more Americans are expanding their activities to other social media properties. 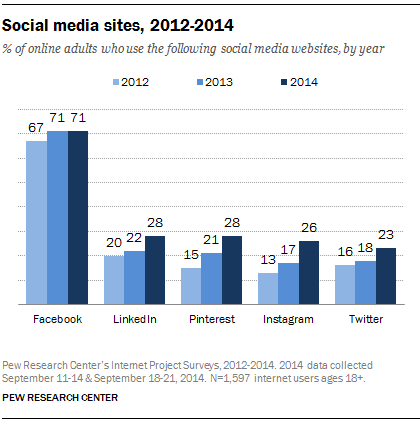 Now, 52% of the online population uses two or more social media sites, up from 42% in 2013. Facebook hasn’t really lost the youth audience, though – it has just captured them elsewhere. Its Instagram network is highly popular among young adults, the report found. Instagram increased its overall user figure by nine percentage points, and it saw significant growth in almost every demographic group. But more importantly, for the first time, roughly half of Internet-using young adults (18-29) in the U.S. use Instagram, and half of them (49%) do daily. This however, is not a significant change from 2013, Pew notes. LinkedIn has also grown its user numbers, and for the first time, the share of Internet users with college educations on the site has reached 50%. Twitter and Pinterest grew across demographic groups, though the latter still heavily caters to women. 42% of online women are now on Pinterest, compared with just 13% of online men. Engagement on Pinterest and LinkedIn hasn’t really grown, though, the report says. 17% of Pinterest users visit the service daily, also roughly the same as 2013. And only 13% of LinkedIn users engage with its platform daily, which is unchanged from 2013. Twitter, unfortunately, is seeing declining engagement. “36% of Twitter users visit the site daily, but this actually represents a 10-point decrease from the 46% who did so in 2013,” states Pew. Twitter has mindshare in the U.S., and is a top five social network, but the declining engagement speaks a lot to some of the core issues that surround the company today: mainly that people still have a hard time “getting it,” from getting started after sign up to finding friends, to understanding why they would want to check in with their Twitter network daily. The data in the survey was collected from multiple surveys focused on U.S. Internet users. 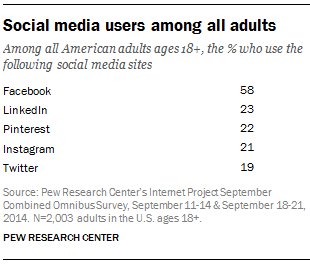 81% of all Americans 18 and up are online, Pew says.